The Hera upper assembly! The receiver is a flat top M4 Mil-Spec upper receiver are forged CNC Machined from 7075-T6 Aluminum, the hardest and most durable material of any upper! This 16” 5.56 barrel is made from 4150 Chrome Moly steel, has 1:8 twist rate & carbine gas system. This incredible rail has 200% increase in keymods, so your attachment position options are endless! The rail is a 15” Hera Arms Free Float Keymod rail made from Airplane Aluminum and then hard coat anodized to improve the strength! Ordered on 6/21 received on 7/1. 7/2- took it to the range this morning for the initial break in. I had zero jams or FTF out of 300 rounds. Upper is very nice looking and the hand guard is very sturdy. The only issue I have with the aluminum hand guard is that it does get quite warm with rapid firing which means I will need to get some inserts or maybe a vertical grip. I started off with 4 inch groups at 50 yards but at the end I was getting 2 1/2 inch groups. This was probably more me getting use to the rifle then the rifle itself as it is lighter then my other AR. Initially the mag that comes with the kit would not hold the bolt open when empty but after loading the mag a few times and firing it started working correctly. Lower parts kit is standard but works as it is intended to. I would defiantly recommend this kit to friends and family as you get a quality upper for a great price. 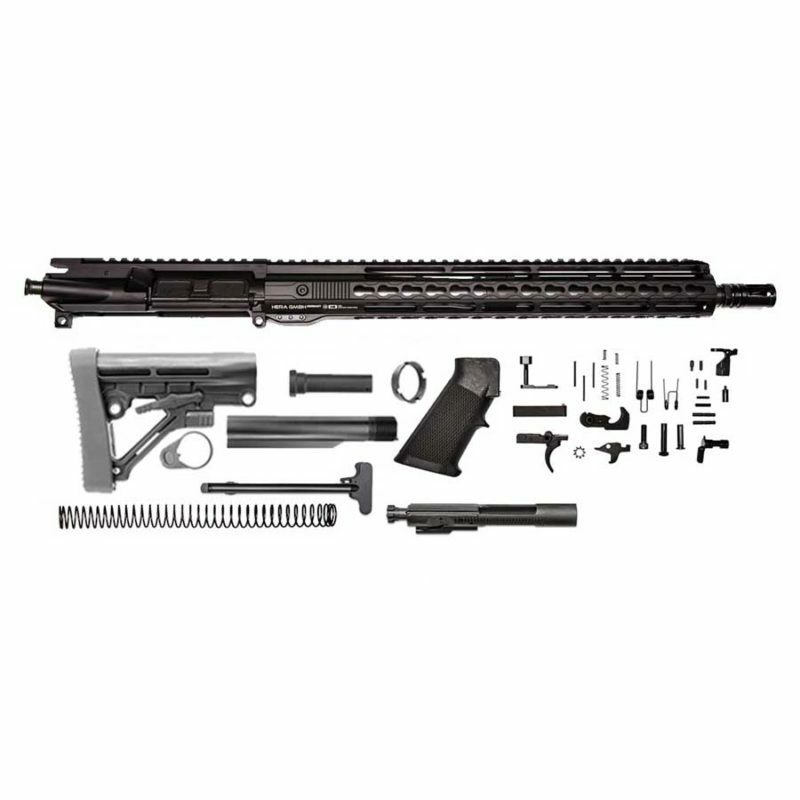 Overall this is a decent upper and build kit. As has been mentioned in other reviews on this site make sure you check the barrel nut and other screws. My barrel nut was only hand tight. I properly torqued the barrel nut and used some red loctite, used blue on the forend screws. When used with a built lower I already had I shot good groups for a 50yd zero. Appears to be a good quality barrel. Some of the included parts don’t match the photo. Buttstock is different, mag is a 20 round and pistol grip is different. Nothing bad but be aware there are differences. The Hera forend is very small diameter, I’ll be adding some rail covers to improve the grip and diameter. I picked this kit up while on sale and due to that I feel it’s worth the price I paid. If I paid the listed $599 I would not feel like it was a good deal.